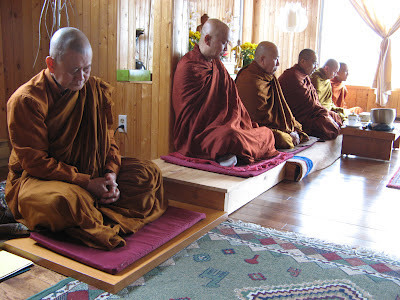 I recently returned from a retreat at the Pannarama Meditation Center in Laval, Quebec. The center where I go keeps to a schedule starting at 4:30 in the morning and ending at 10:00 at night. There are two meals, one in the morning and one at about 11:30 AM. There is a talk by the monk leading the retreat (Ven. Khippapanno) at about 7:30 PM, but since it is in Vietnamese, I don't attend it. The rest of the time there are alternating periods of sitting and walking meditation and a chance to go for an interview with one of the monks every other day. I have always found that the first two or three days when I am on these retreats, I am extremely sleepy. I am constantly falling asleep while I am doing sitting meditation, and I often cannot sustain walking meditation for more than about 20 minutes without wanting to sit down again and rest. There is a period between 12:00 and 2:00 in the afternoon for a rest, so it is possible to fit in a substantial nap. However, despite all these opportunities for sleep and rest, I am very sleepy. However, about the third day I suddenly wake up. I no longer fall asleep while meditating, and I don't feel the need to take such a long nap. From that point onward I am energized. When I leave the retreat I face a five to six hour drive to get home. But I am totally energetic and find it hard to go to sleep until 1:00 in the morning when I return. What is going on? This phenomenon is not unique to me. I have discussed it with others who have much the same experience. I used to think it was because I was super stressed before the retreat and did not get enough rest, and I needed the extra sleep and rest to recuperate. However, I was not super stressed this time. I had stayed with my daughter near Ottawa so I only had to drive about two hours to get there. And I wasn't stressed in general since I am now semi-retired. I have long realized the difference between being on a retreat and being "in the world." When on retreat, there is not a lot of external stimulation. We are supposed to observe "noble silence," but people do talk, although much less so than they would in ordinary life. The meals are all prepared for us (and they are very good, by the way). You have to do a few chores, but nothing very onerous. You are not supposed to read or write. Although no one enforces that rule, I don't feel the need to read or write and I recognize how it can interfere with meditation. There is no internet to surf or email to follow, which is a big shift for me. You can use the phone only in emergencies. I generally stay at the center, although I occasionally take a walk in the neighborhood around the center. But I don't buy anything in the stores in the area or interact with the people I encounter. When on retreat, the big change is from an external focus to an internal one. I think the explanation for the exhaustion of those first few days is simple. Keeping up the external focus required for being in the world is exhausting. When the need to keep it up is gone, we have to recuperate before we can tune into what is going on internally. Once we rest and recuperate, we have the ability to focus inwardly and to meditate. And having that ability to concentrate and focus comes with a burst of energy that carries over into the days following the retreat, provided you are not overwhelmed by the stress of a return to "real life."